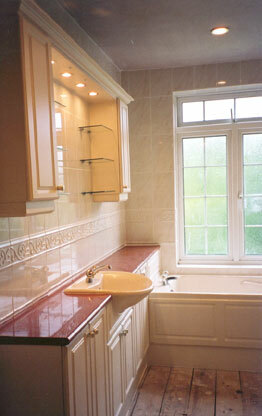 This 1970’s bathroom was completely stripped of its content, including wall tiles and high level pin cladding. The new room comprised of a replacement ceiling and replastering of two walls. The main feature is the utopia bathroom units finished in Julia Cream and complete with matching bath panel. The wall units were complimented by low-voltage lighting fitted into the flyover section. The existing shower cubicle was replaced with a larger Showerlux enclosure, and Aqualisa Aquastream low-voltage all-in-one power shower was used in the cubicle and the dwarf wall behind the toilet pan and cistern removed to give a better feeling of space. The walls were complimented with Porcelanosa tiles.